J-Pac is a leading manufacturer of biomedical textile devices, many of which must adhere to stringent anatomical geometries. We manufacture implantable-class textile based devices in four Class 7 clean rooms which contain customized equipment allowing 3D shaping without altering the base geometry and strength of the textile material. 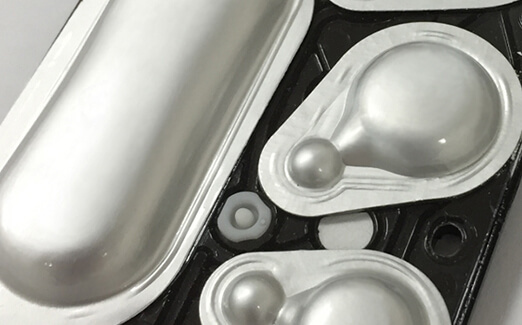 Our textile products are often combined with other sterile devices in custom, ready-to-use sterile procedure kits that are designed and manufactured in-house on our thermoforming equipment. All our manufacturing processes are validated. 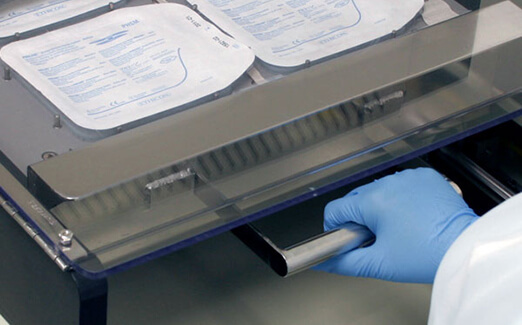 Our capabilities also include custom fabricated mesh bags and filters for tissue bank allograft processing. These mesh bags and filters are manufactured and sterilized to the highest quality standards to improve cleanliness and adhere to FDA guidelines. J-Pac has developed unique manufacturing processes that allow customers to achieve anatomically correct shaped textiles with particulate-free, smooth edges that prevent rritation of the surrounding tissue. Our processes include 3D forming, welding, sewing, and bonding an array of textile materials without altering the base properties of the raw material. In fact, we are able to increase the strength of the material at the joints and increase stability in many cases. 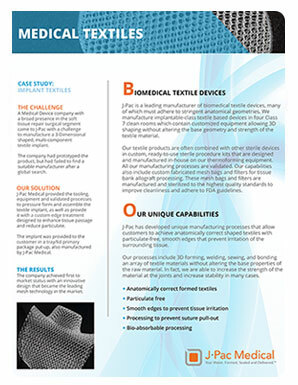 Read White Papers written by the experts in Medical Textiles.